Hedon is a classic example of a new Norman town. Founded in about 1130 by William le Gros (the Fat One), Earl of Aumale and Lord of Holderness, it quickly became a port and market town of great importance. King Stephen (r. 1135 - 1154) ordered a Royal Mint to be set up in Hedon, and the Royal Charter of 1158 gave the burgesses of the town privileges equal to those enjoyed by the citizens of York and Lincoln. In 1972, however, the government of the day introduced an Act of Parliament which took away Hedon's borough status with effect from April 1st 1974 and overrode all the Royal Charters granted to Hedon over the centuries. Many other small and ancient boroughs suffered this same fate. Even so, Hedon has retained possession of its Town Hall and fine collection of silver, and no Act of Parliament can take away its past glories and history. Hedon today is a thriving town of some 8,000 people. Many of the working population are employed in the nearby city of Hull, yet Hedon remains fiercely independent and maintains it separateness by resolutely defending the "green belt" which separates the town from its larger neighbour and opposing any attempt to build there. Hedon now contains a great variety of housing, from the smaller dwellings and the grander houses of the old borough to the modern dwellings of recent years. Developers have provided a wide range of accommodation from bachelor flats and "starter homes" to four- and five-bedroomed detached "desirable residences." 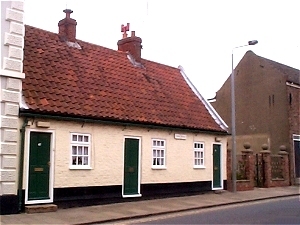 One of the oldest properties in Hedon is Painter's Cottages in Souttergate, dating from 1562. These were bequeathed by George Painter, a Chantry Priest at Holy Trinity Church in Hull, to provide accommodation for three poor men or women of the town. They would also receive three pence per week, half a chaldron of Newcastle coal and six hundredweight of peat or turves delivered free every year. Some years ago internal renovation converted them into two cottages to provide more spacious accommodation. Opposite Painter's Cottages is Burnham House. Built in 1770, it is a fine example of Georgian architecture. One resident, Robert Carrick, was Mayor from 1884 to 1886; another owner was G.B.Newton of Bros. and Holliday, Ships' Chandlers. He served as Mayor from 1907 to 1909. 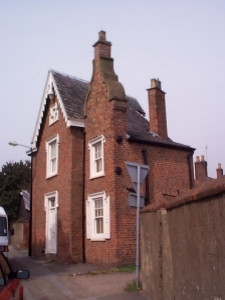 The house remained in the family for several years, the Newtons serving as chairmen of the Hedon Haven Commissioners. An unusual three-storeyed house stands in Churchgate. Built in 1840, the property was acquired by Mr.R.Rennardson who established a joinery business on the premises. The house remained in the family for three generations. On entering the house the visitor is immediately impressed by the beautiful circular staircase rising to the second floor. Being cantilevered from the walls, it leaves an open well through the entire house. The slim graceful handrail takes two complete turns from the bottom to the top. Another unusual feature is a curved door in the entrance hall, made to match the sweep of the wall, which leads into the lounge. A piece of furniture in the hall and another on the first floor landing were specially made by the Rennardsons to fit the unusual angles of the walls. Lambert House on Sheriff Highway was the home of Colonel William Lambert White (1849 - 1929.) He was an avid collector of ruins and built a room entirely of church stones. Known as the Armoury, the room housed his collection of guns, swords and other weapons. The arms are no longer there but the room, complete with gargoyles and other pieces of church masonry, is enjoyed by guests at the house. The garden is on the site of St. James', one of Hedon's mediaeval churches, the foundations of which were visible until the last century. Col. White, who had a business in Hull, was an officer in the East Riding Artillery Volunteers, a Justice of the Peace and Mayor on three occasions. He was great supporter of the church and in 1929 he and his wife presented two new bells to St. Augustines as well as having the six old ones recast, to make the present peal of eight bells. The present owners of Lambert House are B.P. Chemicals and they have restored the house to its former glory. It is now used as accommodation for guests visiting the Saltend plant. Hedon has many objects of interest that remain unseen by the majority of people who live in and visit the town. 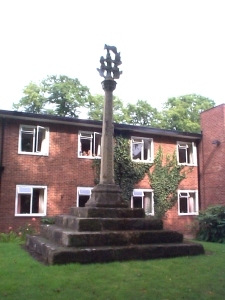 One such object is the Kilnsea Cross which is situated in the walled garden of Holyrood House, a residential home for the elderly in Baxtergate. The cross is said to have been originally erected at Ravenser, near Spurn, on the site where Henry Bolingbroke, Duke of Lancaster landed in 1399, to be joined by the Earls of Northumberland and Westmorland. They overthrew Richard II and Henry eventually reigned as King Henry IV. As the encroaching sea threatened Ravenser, eventually to engulf the town, the cross was removed to Kilnsea. It was again threatened by the advancing waters and in 1818 it was dismantled and removed to Burton Constable, the Constables being Seigneurs of Holderness. It remained in a dismantled state in an outbuilding until James Iveson sought permission from Sir Thomas Constable for it to be moved to Hedon to form a centrepiece for a square of houses to be known as Holyrood. The scheme did not materialise and James Watson eventually built Holyrood House on the site. If one walks down Baxtergate and then turns into the small access road down the side of Holyrood House, the cross can be seen in the garden. After the invasion of England in 1066 by William the Conqueror, Anglo-Saxon Holderness became a Norman Seigniory. Early in the 12th century a settlement already existed at Hedon. As records show, in 1138 the then Lord of Holderness, William-le-Gros, granted a "toft of land" in the town of Hedon to the hospital of St. Leonard in York. William-le-Gros lived in a fortified manor at Burstwick. He had realised that Hedon, lying at the head of a navigable waterway leading to the Humber, would be an ideal site to create a port to serve his Seigniory of Holderness. The port was built and prospered so rapidly that by around 1160 Hedon had been granted a Charter by Henry II giving the Burgesses of Hedon many privileges equal to those granted to York and Lincoln. In many ways Hedon was an early days "New Town" being based from the start on a grid system of streets rather than by random growth. The grid pattern remains little altered in the centre of the town in the year 2001. The Charter granted by Henry II in 1158 was confirmed by one granted by King John in the year 1200, so the year 2000 saw the 800th anniversary of that Charter, a fact that was celebrated in the town. The residents became Burgesses, which meant that they were "free men", allowed to practice their trades freely and buy and sell property within the Borough, whereas the men, women and children living outside the Borough were still under the severe feudal laws of the Lords of the Manor. The Burgesses of Hedon decided to build a substantial and lasting memorial in thanksgiving for their newfound prosperity. 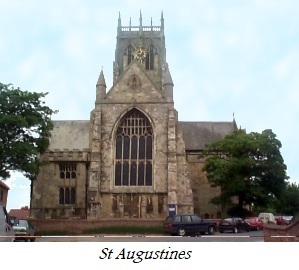 The building of the present church of St. Augustine was commenced in 1190, on the site of a smaller church on Market Hill. Still standing today, the King of Holderness, as it is known, dominates the landscape of South Holderness. The demand for larger ships was Hedon's undoing, as the larger vessels could not navigate up and down the narrow Haven. Some of the merchants developed land at the mouth of the River Hull at a village called Wyke, where deeper water could accommodate the larger vessels. After Edward I purchased land at this developing port of Wyke, it became known as the "King's town upon Hull", now the city of Kingston-upon-Hull. In an endeavour to attract merchants and trade back to Hedon the Burgesses applied for a Charter of Incorporation, which could provide greater privileges and benefits to them. This was finally granted by King Edward III in 1348. This meant that Hedon would be self-governing, no longer under the jurisdiction of the Seignior. This Great Charter gave the Burgesses of Hedon the right annually to elect ten Aldermen and two Bailiffs, and from the ten Aldermen to elect one of them as Mayor. The names of the great majority of the holders of this ancient office are known and are detailed on framed scrolls in the Council Chamber. The Charter also gave Hedon the right to have a Coroner and a Recorder. Uniquely the Court in Hedon, presided over by the Mayor, appointed the churchwardens and, apart from the appointment of the Vicar, had jurisdiction over all the churches in Hedon. Despite this Charter of Incorporation making Hedon a self-governing municipal borough, the trade of the port was reduced to local craft, mainly barges. Eventually even that ceased and the Haven silted up and was abandoned as a waterway. However, Hedon still played an important part in the affairs of the country by returning two Members of Parliament. The first two were returned to Parliament in 1295. For many years after that, no further Parliaments were summoned but from 1537 to 1832 the town was represented by two MPs. 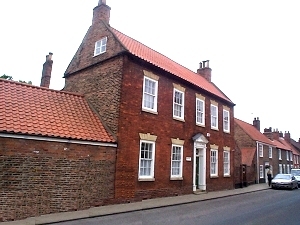 Following the passing of a Reform Act, the Town of Hedon lost the privilege of having its own Members in Parliament. Some of those who represented the Town achieved eminence in national government. One was Prime Minister for a day; one was Minister for War; one a Secretary to the Treasury; several were First Lords of the Admiralty; some became Lord Privy Seal and three circumnavigated the world in search of trade routes for the benefit of the nation. 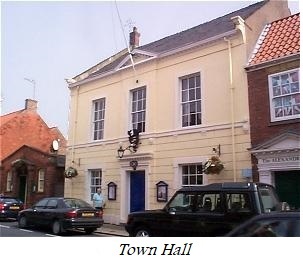 The Town Hall, situated on St. Augustine's Gate and still in use today, was built in 1693 through the auspices of Henry Guy, an illustrious MP for Hedon. The previous Town Hall, or Guildhall, was sited on Market Hill, which was the original centre of administration. Henry Guy also presented what is known as The Great Mace to the Town. The Town Council remain the proud owners of what, especially for the size of the town, is a magnificent collection of silver, including what is believed to be the oldest civic mace in the country. Many of the pieces of silver were given to the town by its Members of Parliament, some pieces are known to have been "lost" over the years when they were regularly passed from one person to another for safe-keeping. It is fair to say that the practice of giving gifts to the town by prospective Members of Parliament led to it becoming known as a "rotten borough". The remnants of many of the Charters are on display in the Mayor's Parlour in the Town Hall. Most, sadly, were damaged many years ago while stored in a room which had a leaking roof, at St. Augustine's Church. The need to conserve documents etc. was not of great importance in years gone by. On the 31st March 1974 the ancient town of Hedon lost its Borough status and many of the powers and responsibilities that went with it. This was a consequence of the passing of the Local Government Act of 1972 - from 1st April 1974 it became a Town Council with the same powers and responsibilities as Parish Councils. The members of the last Borough Council fought hard to retain the status of the town and, as a result and unlike many other Borough and District Councils that lost their identity, it was able to keep and use its civic regalia, retain the office of Mayor, keep ownership of the Town Hall and the silver collection as well as keep control of other matters of importance to the town.